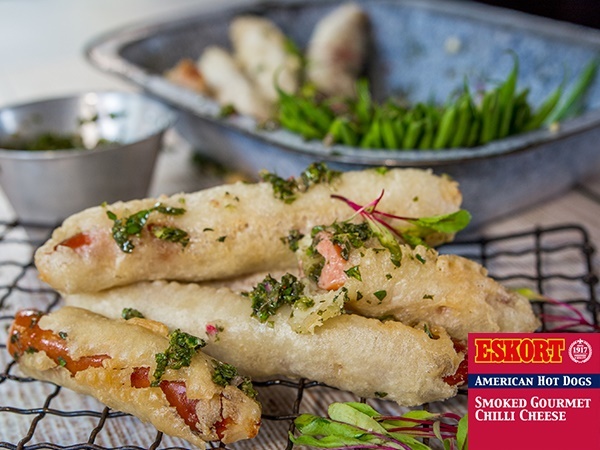 Dipped in a light batter and deep-fried, these crispy tempura chilli cheese hot dogs are served with fresh greens and chimichurri sauce, creating a simple #JustDelicious addition to your picnic basket. Preheat a pot of oil over high heat. Combine the flour, cornflour, and soda water and salt in a small mixing bowl and whisk well to remove any lumps. Refrigerate the batter for 10 minutes. Coat the hot dogs with flour then dip them into the batter. Deep-fry the hot dogs in the oil for 5 minutes until crispy. Combine all the ingredients in a food processor and blend well. Serve with the hot dogs with the sauce. Store any leftover sauce in the fridge in an airtight container.